The elusive search for a quality wireless keyboard may have ended with the Logitech K780. Unlike most wireless keyboards I've purchased in the past, the K780 is not only compatible with Windows and Mac computers, but it has a unique feature that enables users to switch between devices using the same keyboard by merely engaging in the Easy-Switch button, more on that feature later in this post. I've spent a better part of a week using the Logitech K780 wireless keyboard and I have some strong opinions, scroll down for the written review. Regarding design, the Logitech's K780 does meet my standard. Its nicely compact and comfortably flat, measuring just 0.3-inch in the front, 0.9-inch in the back. Unlike most traditional keyboards which have the squared off corners, the Logitech K780 edges are rounded, adding sleekness to the keyboard aesthetics. The well crafted round concave keys almost mimics the old school typewriter, only these keys are a bit bigger. What stands out the most is the rubberized tray that runs right along the length of the keyboard, its primary purpose is to hold mobile devices at a very comfortable viewing angle. There are exactly three Easy Switch keys located on the very top row on the left hand side, its situated between the escape (ESC) and F4 key. The buttons or keys are color-coded in white standing out from the rest. These three corresponding buttons allow users to switch between paired devices; button one connects you to your PC, button two to your smartphone and I'm assuming the third button enables users to connect to the tablet. Since this is a wireless keyboard, you, of course, need to Bluetooth receiver dongle which comes with the keyboard cleverly stored in the battery compartment. Just plug the receiver to your computers USB 3.0 port (Plug-n-Play). That right there is the USB receiver, without you have no coinnection, DUH? I ran into some problems when tried to sync my PC and other devices to this keyboard. I had to power down all my devices so that I can establish a Bluetooth connection. Once I was able to pair my K780 keyboard to my devices, thus far I haven't had any problematic issues. I'm able maintain signal strength as far as 15 feet, without losing any connection. The primary function of the K780 wireless keyboard is to free yourself from your mobile device's touchscreen, which it does very well. With my smartphone or tablet being seated in the rubberized cradle, my fingers seamlessly glide across the keys while responding to a barrage of text messages or typing out documents, a very comfortable experience indeed, almost like I'm using a laptop. 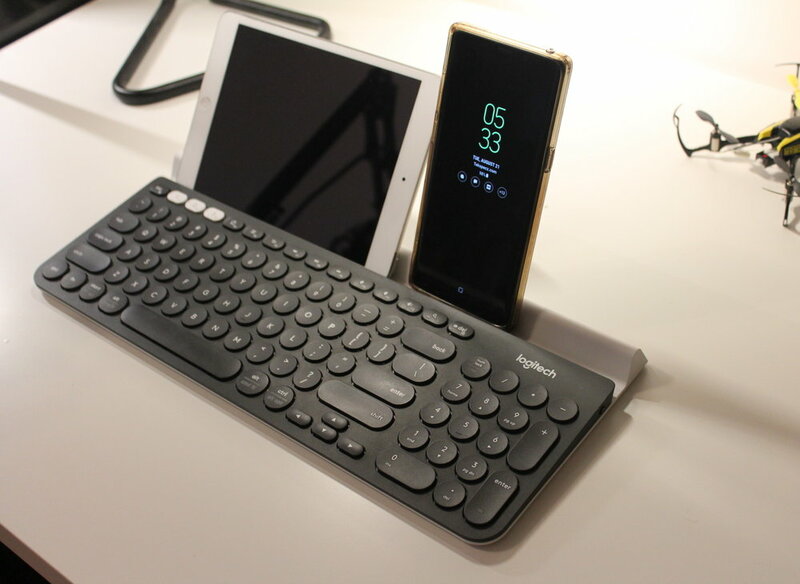 Seriously, would you fit this keyboard into a backpack? If there's one minor gripe with the Logitech K780 I would say though, it's primary purpose is to free yourself from touch typing on a mobile device, this keyboard is not the most portable device around. It Weighs 1.9 pounds, measuring 15-inches in length, it would be somewhat challenging to shove this keyboard into a backpack. Still, it is well constructed enough to handle the riggers of long-distance traveling. From a consumer perspective, I'd say the Logitech K780 is probably one the best keyboards I've purchased to date. It most certainly checks the boxes regarding design and functionality. I'm so enamored with this keyboard, I've decided to make it my daily.